When Did the Stock Market Begin? Buying and selling stocks has been around for centuries – and certain elements have been around even longer than that. Stock market history is founded on an age-old practice of wanting to invest in an enterprise and make money off its performance, and today, that is no different. While it won’t give you a full-proof system for making bundles of cash and getting rich, understanding the history of the stock market is always helpful for beginners and advanced traders alike. After all, those who don’t learn from history are only doing themselves a disservice. The beginning of the stock market has its roots in trading developed a very long time ago. The idea was simple: A group of people would get together and co-own an enterprise, whatever it would be. Some enterprises were commercial. Others were civic in nature. You could go in with a group of merchants on a caravan and split the profits once it returned from its trips. In ancient Rome, it’s thought that shares were actually issued, bought, and sold for organizations that performed certain services for the government. During the Renaissance in the 12th and 13th centuries, Venice and other city –states in Italy began issuing bonds as a way to raise money for wars and other ventures. These bonds were bought and resold, or traded, which is comparable to what goes on now. The first stock exchange as we know it, though, wasn’t created until 1602 with the creation of the Dutch East India Company and the Amsterdam Stock Exchange. The Dutch East India Company was a group of entrepreneurs who banded together to explore the New World and make money off the enterprise. It was an incredibly risky thing to do, so the owners decided to limit their liability just to the amount of money each one had invested in the company (something called limited liability today). They issued stocks and bonds and set up the stock exchange so these assets could be bought and sold – even to the public. Of course, there were other joint-stock companies before the Dutch East India Company. That corporation, thought, arguably spearheaded the idea of trading ownership in a company – even with people who otherwise wouldn’t have any interest in the voyage itself. In modern times (and by modern I mean the last two centuries), stock markets emerged as a way to get members of the public at large to invest money either into stock from companies or bonds from the government. The first modern, major stock exchange created was the London Stock Exchange, which was established in 1698. This was largely the result of a trader named John Castaing, who owned a coffee house and published regular pricing information for various public, joint-stock companies in the country. In the United States, the first major stock exchange was the New York Stock & Exchange Board, created in 1792 on Wall Street in New York City. (One entity – the Philadelphia Stock Exchange – was formed two years earlier). 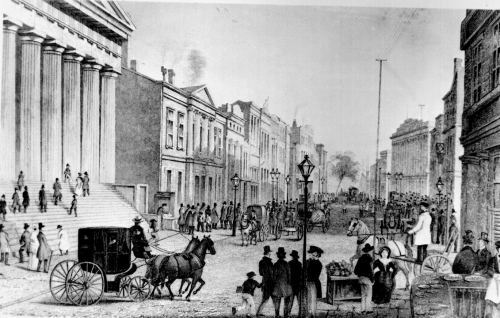 The exchange changed its name to the New York Stock Exchange in 1863. NYSE grew rapidly, and soon it had to relocate and open new buildings to accommodate the large number of traders who began to flock to the trade center. Since then, NYSE has grown to become the largest stock exchange in the world, as determined by the market capitalization of its listed companies (over $14.2 trillion). Other stock exchanges popped up across the world; soon, virtually every major region across the globe had access to an exchange. In 1971, a technological breakthrough occurred; NASDAQ, the world’s first electronic stock exchange, was created. NASDAQ, headquartered in New York City, started off by simply providing quotes to traders, just like a computer bulletin board system of today. It soon turned into a full-fledged stock exchange that connected buyers with stock sellers and took on other features, such as automated trading systems. NASDAQ was also the first stock exchange in the world to allow online trading. There have been other stock exchanges, but they don’t always last. The American Stock Exchange (AMEX) was created in 1911 but was bought by NYSE in 2008. Other exchanges have folded or been absorbed by competitors. There are currently 18 major stock exchanges in the world. The two largest are in the U.S. (NYSE and NASDAQ), followed by the Tokyo Stock Exchange, London Stock Exchange, and Shanghai Stock Exchange. Most major exchanges today are located in North America or Europe, but Asia has several – including two in China, one in Japan, one in South Korea, and an emerging stock market in the Bombay Stock Exchange in India. Thanks to the rise of online trading, it’s possible to trade stocks all across the world – something that’s a far cry from the low-tech beginnings of the market as we know it.